London's fire department has posted photos of Adele meeting with firefighters to offer support following a devastating fire in the borough that is believed to have killed 79 people. It posted the pictures on Twitter on Tuesday, showing the singer posing with firefighters in front of their engine at the Chelsea fire station. Adele had a cup of tea with the firefighters Monday and thanked them for their efforts in battling the fire at the 24-story Grenfell Tower. The London Fire Brigade tweeted: "We are so humbled by everyone's support." 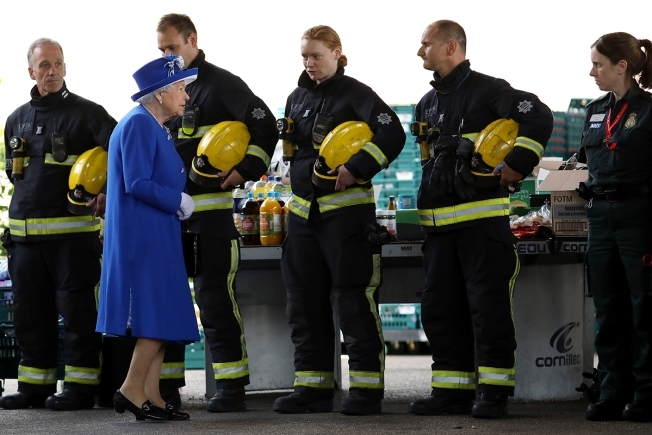 London has rallied behind firefighters with a mixture of awe and support after the blaze. Flames engulfed the building in less than an hour early on June 14, trapping many residents. Firefighters tried to save as many as they could.